Berkeley, Calif.-based Actiview has had a technology for a couple of years now that makes it possible for the deaf or hard of hearing to watch movies using an app that can be downloaded onto their mobile devices. The free app also provides audio description for the blind and audio dubs for non-English speaking individuals. The film is the studio’s 2017 heartwarming family drama Wonder, starring Owen Wilson and Jake Trembley. Trembley plays a boy born with facial differences who enrolls at a regular elementary school for the first time, where he transforms people’s perceptions. To date, the film has earned more than $132 million at the box office, and is available on Digital, 4K, Blu-ray and DVD. The mobile app is designed as a second screen experience, either through headphones or on the user’s phone screen, giving users the ability to play back audio descriptions, captions, multi-language dubs and sign language interpretations of films and TV shows, while watching them on a TV, a laptop or in a theater. The tech company and the studio are working with Nyle DiMarco, the first deaf winner of America’s Next Top Model, who appeared in Cycle 22, and who subsequently won the Dancing with the Stars competition in Season 22, on getting the word out to potential users. DiMarco has become an outspoken deaf activist who is a spokesperson for Language Equality and Acquisition for Deaf Kids (LEAD-K) and his established a foundation that provides access and resources for deaf children and their families. Koren says he simply reached out to DiMarco’s manager by email and received an enthusiastic response. Koren says his company has worked with other studios as well. “We’ve worked with a number of studios to make theatrical and home releases available with access like subtitling, translations, and audio description, but Lionsgate was the first to make the leap into ASL and make a movie fully accessible to every bit of the deaf audience, including deaf children who can’t read yet,” he says. Lionsgate also is making the entire Hunger Games series (all four films in the action fantasy series starring Jennifer Lawrence) accessible via the Actiview app, providing audio description, multi-language dubs, subtitles, captions and amplified audio to all audiences who use the Actiview app. Users can watch Lionsgate’s Wonder or the Hunger Games movies on any available platform and the app will automatically synchronize with their TV. The app “listens” to the movie, similarly to how Shazam listens to songs, and figures out where in the movie the viewer is, matching the playback from their device. Koren says the Hunger Games are not yet ASL accessible, but in a perfect world, "we’d work to make every movie available this way." Users will be able to download the app (iOS only) by searching “Actiview” in the App Store. They then can select the movie they’re watching and the accessibility service they need, such as sign language or audio description. The app is free, as well as using any of the tracks on it. “Access is about inclusivity and we want to ensure there aren’t more barriers to being a part of it,” notes Koren. App users cannot watch the movie itself on the app, though, so they’ll have to stream, rent or buy the title on their favorite platforms like Netflix, iTunes, on DVD, or otherwise. Actiview offers some promo codes in the app for special Actiview discounts on the movies. 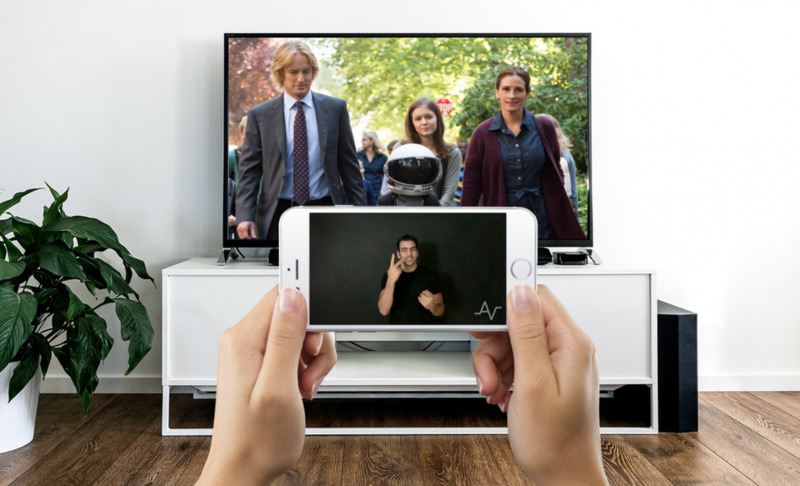 Koren says Actiview’s goal is to make every movie fully accessible so that whether someone’s deaf, hard-of-hearing, blind or low vision, or speak a different language, they can open the app and watch too. Other countries are starting to recognize the value of sign language to augment their films for deaf audiences, but it hasn’t come to the U.S. yet. For example, Brazil recently enacted a law requiring sign language interpretation of all films released theatrically there.